The adhesion of microbes to catheter surfaces is a serious problem and the resulting infections frequently lead to longer hospitalisation and higher risk for the patient. Several approaches have been developed to produce materials that are less susceptible to microbial colonisation. One such approach is the incorporation of photoactivated compounds, such as Toluidine Blue O (TBO), in the polymeric matrix resulting in ‘light-activated antimicrobial materials’. The insertion and removal of catheters can cause tissue damage and patient discomfort through frictional forces; hence the lubricity of a catheter material is also very important. In this work the tribological performance of silicone and polyurethane containing TBO and gold nanoparticles were evaluated using two different surfaces, the inner part of the aorta and the superior vena cava of sheep. 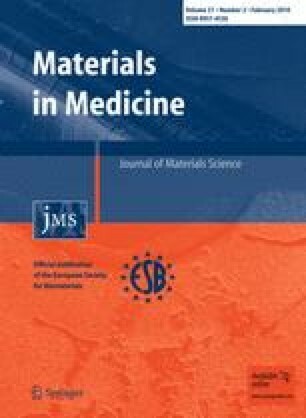 Static and kinetic friction coefficients of these materials were measured using a tribometric device developed for in vitro applications using dry materials and those lubricated with blood. It was found that neither the preparation process nor the presence of TBO or gold nanoparticles, had an effect on the friction factors in comparison to those of untreated materials. In all cases, static and kinetic friction coefficients on aorta tissue were higher than those on vena cava due to higher surface roughness of the aorta. The presence of blood as a lubricant resulted in lower friction coefficients. M.W., J.P. and I.P.P. thank the BBSRC for supporting this work through grant BB/E012310/1; I.P.P. thanks the Royal Society/Wolfson trust for a merit award.